Long legs, tall neck, wide eyes – giraffes are the beauties of the African savannah. But there is so much more to these gentle giants: their exceptional body, their distinctive behaviour, their fascinating social life. For a long time, giraffes have barely been more than decorative extras in African wildlife documentaries – because as soon as a lion appears, the camera usually follows the big cat, and leaves the giraffes behind. Seemingly, the reason is that, beside their size, these watchtowers of the savannah are not spectacular enough. Their image in the public is that of a nice, yet more or less boring creature – but when you look at them up close and personal, this is simply not true. This film takes a fresh look at the tallest animal of all, revealing new details and exciting insights into the secret lives of these true African icons. Do giraffes communicate – and if so, how? How do they sleep? Why do they grow so tall? Even with their long legs and spindly appearance, giraffes are able to climb hills. They seem to have a strange appetite for spiky plants: giraffes not only feed on the leaves of the abundant thorny acacia trees – in Kenya, we see a young giraffe that is learning to feed on cacti as well. Moreover, giraffe bulls put up fierce fights against each other, to win the right to mate with the females. But first, the winner is checking the female’s receptiveness by testing her urine with a special organ in his mouth. 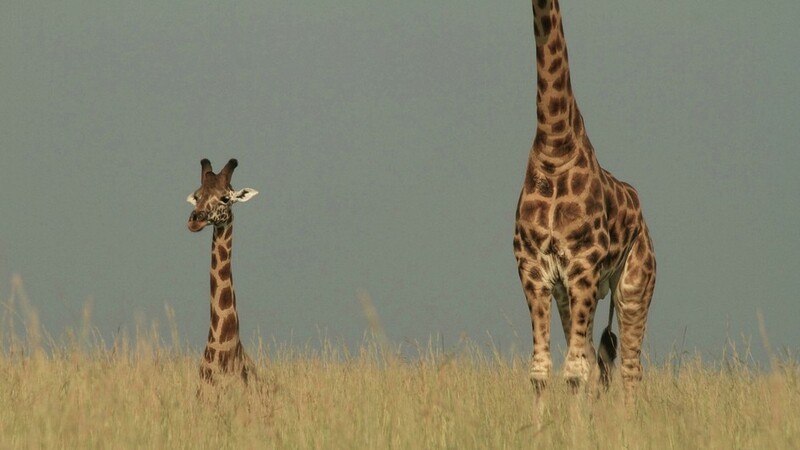 Then, the birth of a young giraffe has quite an impact – since the mother is standing upright, the calf is falling nearly two meters down to the ground. Giraffes also have a rather complex social life – which wasn’t widely known for long. It’s said that they even seem to mourn for their dead. There are nine subspecies of giraffes, each with its characteristic look, skin colour and pattern – but some of these species are already on the brink of extinction. We present the giraffe up high and personal: in the savannahs of Kenya and Uganda, in the South African grassland, as well as in the desert of Namibia. The visual style is very different to the usual approach to wildlife filming: amazing and unexpected camera perspectives and a fresh way of framing. Amusing split screens and stunning points of view. Spectacular never-before-seen footage and some funny cartoon clips. All these elements add up to an extraordinary and entertaining portrait of the giraffe.